Ok, maybe I shouldn't take credit for this one, Tostadas have been around long before me. But I do make mine a little different. 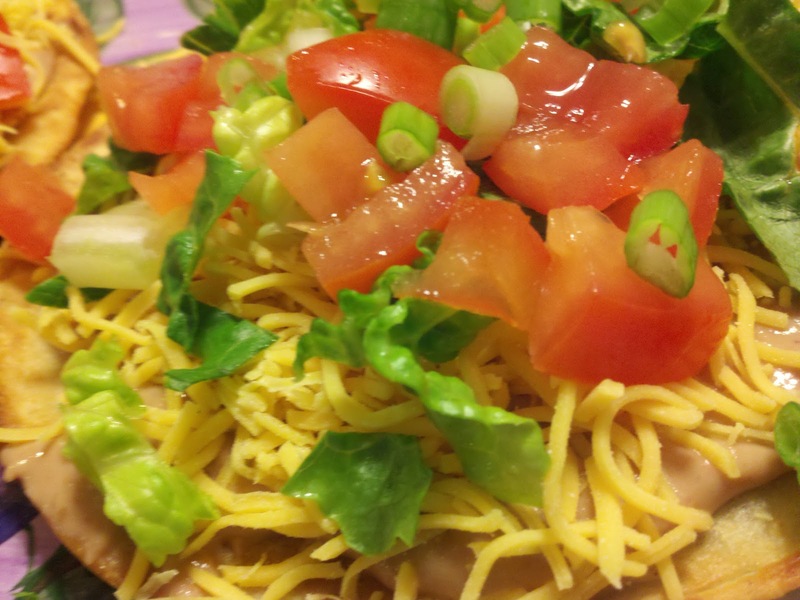 Typically a tostada is essentially a layered bean dip on a fried corn tortilla. And while the layers (if you can get the to actually layer and not mush) can look pretty, I find it's SO much easier to combine the wet ingredients together. This way they all spread evenly and every bite is full of delicious beans, salsa, guacamole, sour cream... Yum! I vaguely remember once upon a time my Grandma made them for us, but when I really became introduced to them was while The Farming Hubby and I were engaged and his Mom made them. I remember her teaching me how to fry up the tortillas as we made them for some family friends coming over. I was so nervous I'd mess them up. I grew up doing a lot of cooking, but not frying. But she was incredibly patient with me as I attempted to do these for the first time, and though I'm pretty sure I messed up a few of them, it didn't take too long for me to figure it out. I still make my tostadas the same way she taught me, and they are a favorite in our house. I don't make them all that often because I tend to forget about them, but every few months I get a craving for them and we really enjoy them! These are a great, very easy dish to make on a weeknight! This really is an easy meal to throw together after a busy day. You can buy pre-made tostada shells at the store if frying them is scary for you, or to save the extra time. But the homemade are just so yummy... lol! If your family doesn't like all the "wet" ingredients you can have them all separate, or just combine the ones you know everyone likes and leave the others one the side for those that want it. I love that each person can assemble their own tostada exactly to their liking! 4 stars. I really like Tostadas. My husband isn't a fan of Mexican food(except for Tacos...lol) Have I mentioned how picky my husband is?? So when I crave it, I invite my Mom up for the weekend and we eat and make a lot of it. I'm thinking it's time for a girls weekend very soon. This looks wonderful! I Looove Mexican food, it's been quite a while since I've had tostadas. They look really good! Oh man... I can't imagine if my hubby didn't like Mexican food... That would be a serious tragedy... haha!I hope you guys enjoy these, they're certainly a favorite of ours. I'm thinking I may have to make them again next week. Posting the recipe made me so hungry this morning. We are big Mexican food fans in this house. The flavors are always so interesting and you can mix up the ingredients in so many combinations. Your tostadas are mouthwatering! Summer on a plate! Yum!I am one of those wimpy folk, though, when it comes to frying. I have to steel myself to use hot oil ... I think I would be buying the tostadas in the stacked bag! Ahhh I LOVE tostadas, these look positively scrumptious! OH my goodness! I can't believe I missed that little tidbit!!!! Ok, so totally giving this a try soon! Thank you so much!